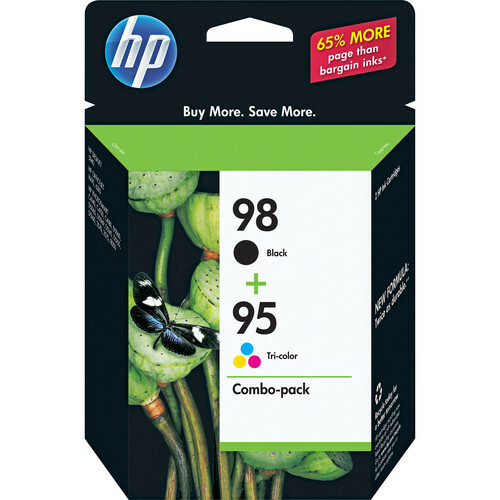 The HP 95/98 Twin Pack Ink Cartridges (Black and Tri-Color) provide rich, lifelike color for vibrant, professional-quality graphics and photos that resist fading for generations. The genuine HP inkjet print cartridge provides proactive alerts so you'll always know when ink levels are running low. Box Dimensions (LxWxH) 6.6 x 5.2 x 2.0"
95/98 Twin Pack Ink Cartridges - Combo Pack (Black and Tri-Color) is rated 4.8 out of 5 by 60. Rated 5 out of 5 by Jag51 from Great quality I have always used HP printer cartridges because of the quality and ease of installation. My workplace orders recycled cartridges and the quality is substandard at best. I also very much appreciate being able to order online and receive next day free shipping. Rated 5 out of 5 by LTWS from Exactly as described, well packaged Product was exactly as described, came well packaged, works as promised, arrived quickly. I'm very satisfied. Rated 5 out of 5 by LouT48 from Great product I like the combo ink cartridges, and the ease of using the site with a discount and free regular shipping was very good. I don't remember seeing the double black inkjet cartridges on the site now, and I get those locally when on a sale or with a coupon. Obviously, the black is used more often than the color. I have also purchased another photo cartridge recently. The real HP cartridges last and store well. Rated 5 out of 5 by nora65 from Very good product. Will purchase again very pleased with this. Rated 5 out of 5 by Midnightfirewolf from Excellent Product I have been using HP 95/98 cartridges in my printer to produce beautiful color prints of photographs I have taken. I've never been disappointed in the results, nor the fact that the colors stay true over the years. I've never had printer problems due to failure of a cartride, or had a cartridge plug or blot a printed page or picture. Easy instalation, and removal.